Whenever we review a budget smartphone, our job is to weigh the handset's cost against its similarly priced rivals. You'd hope, for instance, that if you spent $500 on a device, you'd be getting your money's worth no matter which manufacturer or ecosystem you chose. If it's only $300, then you have to consider if the particular set of compromises made to reach this price point were the right ones. Acer's Liquid E2 (V370), for instance, will retail SIM-free for around £180 ($276) and is likely to arrive on ThreeUK in the near future, presumably with a hefty discount. But even if it were offered for no up-front fee, would it be worth signing away the better part of two years to own one? Given that it's in the same price range as the Samsung Galaxy Ace 2 and HTC Desire C, should you be picking this handset when it's time to upgrade? Be the first to review the Liquid E2? Whip the 140-gram (4.9-ounce) E2 out of the box and the first things you'll notice are its reassuring heft and sturdy chassis, which give the impression that it can take a beating while you're out in the field. Unfortunately, we did manage to drop the phone (from waist height) on some gravel, which scuffed the bezel and reminded us that clumsy users should probably invest in a case. Rather than the usual earpiece slot, your ears will be pushed up against a curved cut in the front frame which reveals a recessed speaker grille done up in hot-rod red. It may be a small touch, but that one little flourish serves to liven up the otherwise clinical design, giving it a much-needed injection of personality. While our review unit is white, the same red flash is present on the black version too. Below the earpiece, you've got the company logo, while to the left you'll find the forward-facing VGA camera. Beneath the display are the usual trio of capacitive buttons and the primary microphone. The mic's placement is telling, since it's cut out of the bezel on the right-hand side, and with this asymmetrical alignment, it's clear that the E2 is designed to be held in your left hand -- after all, if you held it in your right, the microphone would be getting far too cozy with your jowls. Going around the frame, the left side is blank, while the right edge is home to the volume rocker. Up top, you've got the 3.5mm headphone jack and the power / screen button, while down below is a micro-USB port. Flip the handset over and you'll notice that Acer wasn't content to just include a rear-facing speaker where it's convenient. Instead, the company has added a pair of circular speaker grilles at either end of the back cover that resemble tiny pizza plates (more on that later). Tucked beneath the uppermost of the two are an 8-megapixel camera, LED flash and secondary microphone. The lower speaker, meanwhile, adjoins the gap in the plastic where you can pull off the E2's rear cover, which features the customary creaking and snapping sounds so frequently associated with a flimsy plastic back cover. Still, lift the back cover away and you'll find a 2,000mAh battery, a full-size SIM slot (yep, it's 2013) and a microSD slot with support for cards as large as 32GB. Internals-wise, the device packs a 1.2GHz quad-core MediaTek MT 6589 Cortex-A7 CPU paired with 1GB of RAM and a slender 4GB of internal storage, of which around 1.6GB is actually available for you to use. We aren't big fans of phones with this little storage, but at least the microSD card expansion enables us to grin and bear it -- as will you if you decide to buy this. As for radios, the E2 only offers HSPA+, so you won't be able to take advantage of the UK's burgeoning LTE revolution, unlike some other recently released handsets. The Liquid E2's 4.5-inch, IPS LCD non-PenTile, qHD display gives you a pixel density of 245 ppi and we think that's a reasonable stat given its budget status. Understandably, however, there are some caveats you should be aware of. First up, video reproduction is adequate, but we did find that colors were washed out no matter how we tinkered with the display. Then there's the backlight, which struggles in strong sunlight, although it's not as bad as some handsets we've seen of late. Finally, in the right light and with the display off, it's very easy to see the LCD matrix beneath the glass. 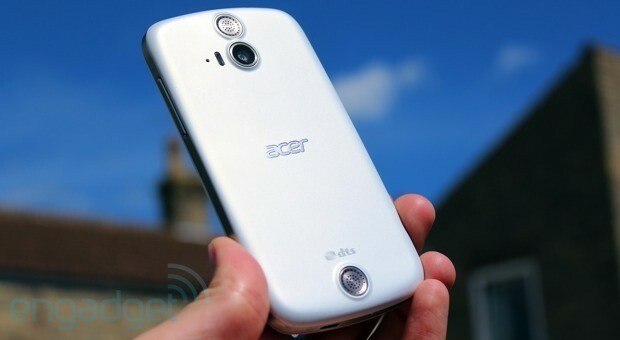 Acer's most radical design decision was to include a pair of circular speakers at either end of the E2's rear cover. 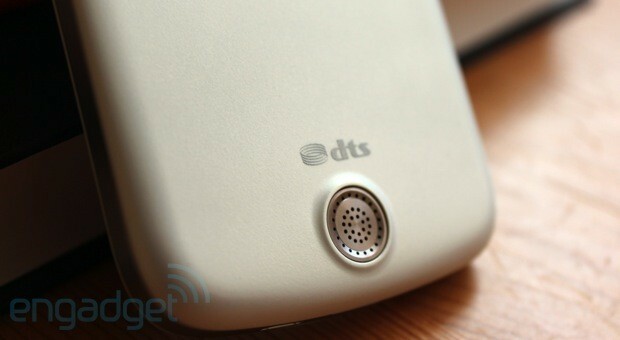 The company has also included a grand DTS logo to boast about this handset's audio prowess, and we think in doing so Acer has made a rod for its own back. You see, it's a constant complaint of ours that rear-mounted speakers are only as good as the likelihood that you won't cover them with your hand while holding it. In this instance, Acer tinkered with the sound so that it's mostly coming out of the lower speaker, which would be on the right-hand side if you hold it in landscape. Understandably, that's only right if you're right-handed, so southpaws who were hoping to annoy their fellow commuters with a blast of obnoxious music should look elsewhere. Having suitably raised our expectations, however, the E2's audio quality earns more than a few demerits. While streaming video on BBC iPlayer and Netflix, as well as playing locally stored movies, we found that the mono sound weak and tinny. The bundled DTS software panel doesn't help matters: whenever we hunted to find a setting that eliminated the weak audio, we were left with rattling speakers and scratchy audio. While the DTS feature boosts the volume of the speakers (which are too weak on their own), it's also a one-way ticket to rattle town. In the end, we found it was better for our mental health (and that of our neighbors) to disable the DTS panel altogether and use headphones instead. Does your wallet not stretch as far as a "Google Play edition" handset, and do you wish that a "name" brand phone maker would keep its pernicious skinning to itself? Well, Mr. and Mrs. Acer have just leapt to the top of your Christmas card list. 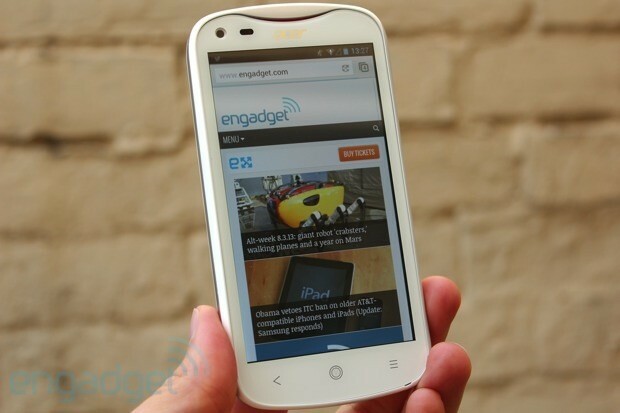 Yes, there are some minor tweaks to the Jelly Bean experience (the phone ships with Android 4.2.1), but essentially, you're experiencing as close to stock Android as Acer can make it. In terms of changes and bloatware, there's a Sense 4-esque calendar and weather widget, and perhaps most notably, the DTS Audio panel that we've already discussed. Suffice to say, it wasn't long before we'd just switched off its helpful attempts to "improve" our audio, and hope that it doesn't bother us again. On the upside, power users will be delighted to see that Swype has been installed as a keyboard option and can be activated from the get-go by hitting the toggle on the bottom-left corner of the screen. Users will also get access to AcerCloud, the company's platform that lets you sync photos, videos, music and documents to any other Android or Windows devices that have the app -- which we discussed in far greater detail in our review of the CloudMobile. 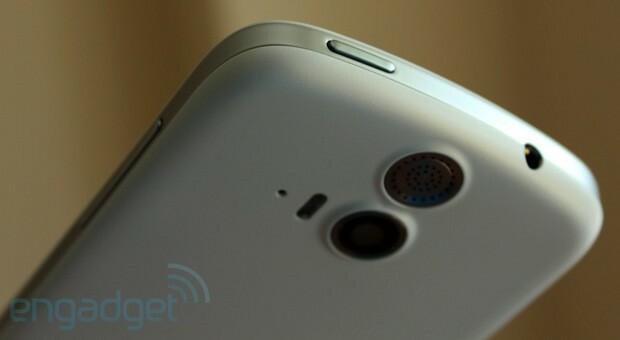 Since even lower-end smartphones now come with a good 8-megapixel primary camera, we were expecting more from the E2. Unfortunately, we were disappointed by our washed-out sample shots, which lacked crispness and detail. Fatally, too, the camera has difficulty dealing with high-contrast images taken on a bright summer afternoon. The backside-illuminated autofocus module doesn't handle close-up or long-distance shots too well, with vibrant flower colors dialed down and the images winding up pretty noisy. HDR photography doesn't really improve the situation and, as usual, users and their subjects are required to stay perfectly still or else the pictures will emerge all ghosted. By default, the forward-facing camera is set in "Face Beauty Mode," which, like Nokia's Glam Me, aims to digitally screen out users' visible wrinkles. Unfortunately, even when we dialed the cosmetic settings up to full, it didn't really improve my skin tone -- reminding me that I really need to up my game when it comes to cleansing and toning. Unsurprisingly, these results carry over to the video, with the E2 offering faded colors, fuzzy images and very little detail. The clips are also heavily compressed with a data rate of 1.06 MB/s. 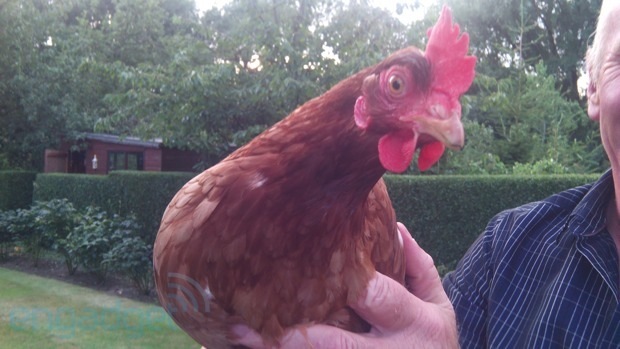 Generally speaking, we wouldn't feel comfortable using the camera to document precious life moments. As for sound, the secondary microphone picks up a lot of wind noise, which is a shame given that we were hoping that the two mics would help to screen some of the distortion out. The marriage of a 1.2GHz quad-core Cortex-A7 with 1GB RAM shouldn't make for the fastest of devices, but the Liquid E2 never feels as if it's been built on the cheap. 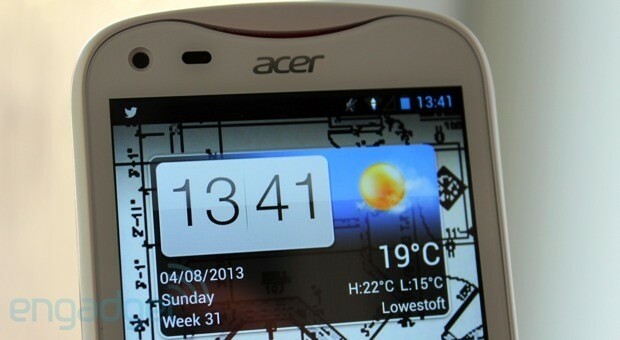 While some credit should go to Project Butter, Acer has at least put together a usable piece of hardware. The handset was surprisingly responsive and hardy in the multi-tasking department, taking it on the chin when we flipped through seven or eight apps at once, flipping between audio, streaming video and a cached movie. While performance may have slowed a little, it didn't stutter or fail as we've seen on other handsets, and we're happy to commend the E2's chops in this department. High-performance games like Riptide GP and Temple Run 2 were also dispatched with relative ease, with stutters kept to a surprising minimum. Remember to ensure your expectations are suitably lowered before taking the plunge. Drilling down into the E2's benchmarks, we see this phone doesn't sweep the board. Though it bests the ill-fated HTC First in the SunSpider browsing test, it lags badly in graphics tests. It shouldn't be too surprising to see that big-ticket graphics performance is beyond the ken of this device, but it'll certainly handle less demanding tasks like using Twitter and checking into Foursquare. On the subject of boot-up times, the E2 will launch after 30 seconds and shut down in around six, which is certainly acceptable for a device in this class. A 2,000mAh battery is becoming an increasingly standardized smartphone spec, and we had reasonable expectations that this device wouldn't let us down in the power stakes. In our standard video rundown test, with the display set at 50 percent and WiFi on, the E2 lasted six hours and 51 minutes. That puts it ahead of heavy-hitters like the Galaxy S4 Active (6:13), HTC One (6:30) and just behind the Droid 4 (7:15) and the similarly low-priced Nexus 4 (5:18). While out and about, we found that the E2 managed about half a day of reasonably constant use before we felt compelled to reach for the micro-USB cable. For the minority of you who still use your smartphone as, you know, a phone, you'll be interested to hear about the E2's call quality. Unfortunately, we found that the audio was severely muffled and scratchy, and when we reached to turn the volume up, we were dismayed to see that it was already maxed out. Testing this unit's prowess with mobile data, we were able to pull down 7.49 Mbps down and 1.45 Mbps up on Three UK's HSPA+ network out here in the sticks. While we don't yet know how much Three (or any other UK network) will charge for this phone on a contract basis, Acer is pricing it at £180. For that sum of cash, you can buy a Lumia 620 running Windows Phone 8, while an extra £10 will get you either Samsung's Galaxy Ace 2 or LG's Optimus L5 II. How much more would it cost for you to get out of the smartphone equivalent of the bush league? About £60. Yes, we know, if you're looking at this phone, you might not have that sort of cash to spare, but if you do, then you can grab the Nexus 4. 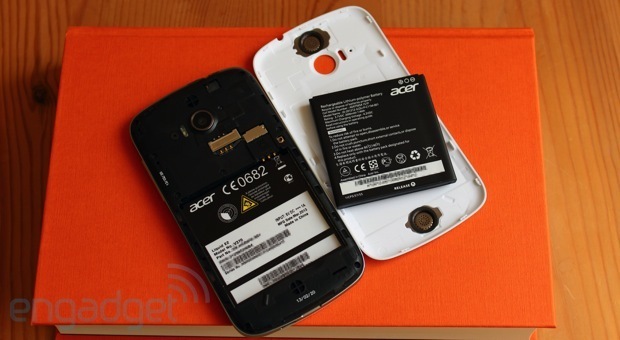 It won't shock you to know that the Nexus 4, another 3G-only phone, has a fantastic camera. It's also a Nexus device, of course, so you won't need to wait around for your phone maker to start supporting the latest build of Android. And, perhaps most importantly, it delivers flagship-caliber performance for around half the price you'd expect to pay. We opened by saying that budget handsets require reviewers to dial down their expectations, taking the low price into consideration and seeing if it softens what might otherwise be serious objections. In that regard, we run the risk of either damning the device with faint praise or, equally, giving a free pass to some of its more egregious flaws. When it comes to Acer's Liquid E2, we feel that it's utterly unspectacular in every way, but given the target market, that isn't necessarily a bad thing. If you're looking for top-notch performance, a better camera or a productivity powerhouse, then this handset won't be for you. If, however, all you need is an affordable phone that can check the news, tweet and take the odd unimportant snap, then this is a perfectly acceptable option with decent battery life, to boot. Just remember to ensure your expectations are suitably lowered before taking the plunge. For everyone else? Walk toward the Nexus 4 and don't look back.